Pound Wood is one of over 40 ancient woods which survive amid the 20th century suburban development of South-East Essex. Most of these woods are to be found on the horse-shoe shaped range of low hills on which the settlements of Leigh, Hadleigh, Thundersley, Rayleigh, Hockley, Hawkwell, Ashingdon and Canewdon were established. In the past, poorer soils on this land induced farmers to leave some areas as heath and woodland, especially on the sloping sides of the hills. Pound Wood occupies part of the gentle northern slope of a ridge of higher ground which rises to 70 metres above sea-level at Daws Heath, north of Hadleigh. The wood lies between 50 and 70 metres above sea level. To the south, the land slopes down to the Prittle Brook which runs through West Wood and Hadleigh Great Wood, while to the north lies the valley of the Eastwood Brook which rises at Rayleigh Weir and flows eastwards just north of the A127. These streams are the southernmost of four which flow eastwards to join the Roach estuary at Rochford. Pound Wood is drained by 3 small streams (recently named Hunford Brook, Hall Brook and Miles Brook) which emerge from the pebbly gravel near the higher, southern edge of the wood and flow north-eastwards to a confluence point in the lowest, NE corner. From here they flow beneath the A127 northward to the Eastwood Brook and thus contribute to the Roach drainage basin. Their flow is very variable, often being little more than a trickle, but the easternmost Miles Brook receives an overflow outlet from the Oakwood covered reservoirs at the end of Bramble Road and periodically carries a higher discharge than the other two brooks. Indeed, boggy conditions adjacent to this stream have necessitated the building of quite a long bridge (known as Codger’s Crossing) where Wilkins Path crosses Miles Brook (see nature trail map). The elevation of Pound Wood varies from just over 70m above sea level in the south-west, to less than 50m in the north-east. Soil movements on this sloping site, especially in the periglacial conditions which existed at the close of the last Ice Age, make the geology and soils of Pound Wood quite complex. In general, the hills of S.E. Essex consist of a sandy deposit called the Bagshot Beds which overlie the London Clay of the lowlands. Prittle Brook and Eastwood Brook have cut into this material exposing the mixed sands and clays of the Claygate Beds which form a transition between the sands of the Bagshot Beds and the London Clay beneath. The origin of these three deposits is as follows. About 50 million years ago, rising sea-levels flooded the Thames Basin and rivers flowing from the west brought in muddy sediments to form the London Clay which today forms much of Essex. In time, this basin became shallower and in places mixtures of sands and clays were deposited in river estuaries. These are known as the Claygate Beds and they are in turn overlain by sandy deposits known as Bagshot Beds, the remains of sand banks in river deltas which formed on the edge of the ancestral North Sea. Crustal movements caused uplifting and the London Clay, Claygate and Bagshot Beds became dry land. The present hills of SE Essex, and Dengie are the remnants of the high ground between the valleys of two tributaries of the forerunner of the River Thames (the Proto-Thames) which in those days flowed to the north of its present line, probably joining the forerunner of the River Rhine to flow northwards across the plains where the southern North Sea Basin now lies. The Ice Ages changed this scene forever. The Proto-Thames was diverted southwards by the advancing ice sheets to its present position. As the ice stopped in mid-Essex, the land to the south consisted of a frozen waste where summer melting caused slumping over the frozen ground beneath, and meltwater streams spread gravels. 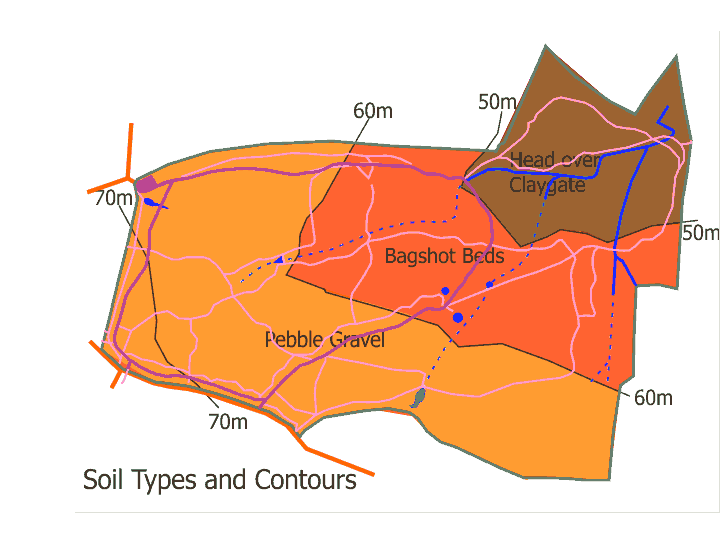 Thus the soils of Pound Wood vary from pebbly gravels on the highest ground, through Bagshot Sands to clays on the lower slopes. Post-glacial slumping on the slopes has mixed these layers into a material called head which now occupies the lower parts of the Wood. Subsequent to the creation of the head deposits, loess, a fine silty material, was blown in before trees re-established themselves, and this provides a capping a metre or more deep. The loess has been washed from much of SE Essex but is preserved in parts of Pound Wood (sometimes visible around the exposed roots of windblown trees), and some other local woods, where the tree cover has protected it from removal by running water. This suggests that at least some of the Wood has existed since the wildwood first spread into the area after the last Ice Age. The climate of south-east Essex is similar to that of north-eastern France and Belgium, being slightly more continental than other parts of Britain. This gives warmer summers and lower rainfall than further west, but being near the sea, the winters are a little milder. There are no precise climate records available for the Daws Heath area but interpolation from nearby stations at Shoebury and Southend Airport suggests a mean annual rainfall of between 550 and 600mm. The low rainfall gives relatively dry conditions underfoot in the summer but mud can be a problem in winter, especially on the less permeable soils lower down the slope. Springs from the hill-top gravels feed the three streams in Pound Wood but their discharge is often negligible. Mean July temperatures approach 18oC, a high figure compared to other parts of Britain. In contrast, mean January temperatures fall to 3.5°C, giving an annual range in excess of 14°C. Being 70 metres above sea-level, Pound Wood is slightly more likely to suffer frosts and snow than the lower ground further east around Southend, but lying snow is relatively rare.